Team Katusha confirmed that Kim Kirchen has been put in an induced coma following a heart attack at the Tour de Suisse Friday evening. The team said Kirchen's medical state has now been stabilized, and the Luxembourg time trial champion is expected to remain in the coma for observation for at least the next 24 hours. Although the team describes the incident as a heart attack on its website, it also states that doctors have ruled out infarction, which is the medical term for a heart attack, with a thrombosis [blood clot] also being ruled out as the cause. "Based on the tests done until now," the team website said, "it is possible to exclude both a infarctus or a thrombosis." Kirchen's wife is due to have twins next week. "He was so happy he could be there, since it was just before the Luxembourg Championship and the Tour," explained journalist Denis Bastien from Le Quotidien. "He had also learned Friday that he was selected for the Tour [de France]. He wanted to take to opportunity to make up for his difficult spring." During the Ardennes Classics he had complained of dizziness and shortness of breath, which were the same symptoms he exhibited Friday evening when his roommate Joaquim Rodriguez called for help. Doctor Andrei Mikhailov and Marc-Joseph, a family friend of Kirchen, began to perform CPR, according to De Standaard. Just before midnight he was on an oxygen mask and rushed to the University Hospital of Zurich. Whatever the case, the fact that doctors have induced a coma cannot be good news. "He felt bad so the team doctor sent him to hospital," explained sports director Serge Parsani about the incident when he collapsed Friday evening. "He already had a similar kind of problem two or three months ago. We don't know [what the problem is]." His problems started around the E3 Prijs when he had a badly infected saddle sore. He went on a heavy dose of antibiotics, but when he had a bad reaction to the medication he checked himself into the hospital for further treatment. Doctors couldn't find any problems with the Katusha rider and sent him home. His next race was supposed to be the Brabantse Pijl, but two days prior to the event he was found unconscious on the side of the road and taken to the hospital in an ambulance. Again doctors couldn't diagnose the problem, which resurfaced in Flèche Wallonne during the first climb up the Mur de Huy. People close to Kirchen told the paper "his vision went black, and he suddenly didn't know where he was". 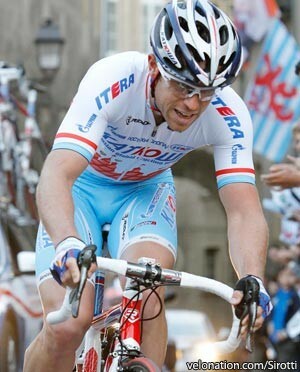 The 31 year old came to the Katusha team this year following two years with the American HTC-Columbia squad. Kirchen spent two years with its predecessor T-Mobile after five years with the Italian Fassa Bortolo squad. He began his career in 2000 with the De Nardi-Pasta Montegrappa team. Kirchen's biggest wins were the Flèche Wallonne in 2008 and stage 15 of the 2007 Tour de France. Along with two seventh place finishes in the Tour de France and an overall win in the 2005 Tour of Pologne, he's been twice the champion of Luxembourg on both the road and in the time trial, and has taken stage wins in several week-long stage races and smaller one-day events. He is the reigning time trial champion of Luxembourg, with his other most recent success being stage seven of last year's Tour de Suisse.